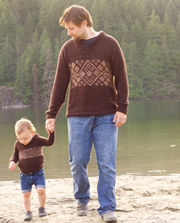 What's cuter than father-son matching sweaters? Eating smores while wearing them around the campfire on the family camping trip! Lets have some ghost stories! Child sizes are knit in DK weight yarn and adult sizes are knit in Worsted / Aran weight yarn. notes This pullover is knit from the bottom up, in the round. Body and sleeves are knit to underarm, then joined for working the yoke. The shawl collar is picked up and knit last. The campfire pattern is available as an individual pattern download, or as part of the Pacific Knits collection.